This recipe makes a double batch or one batch of kale chips and some great salad dressing if the remaining sauce is thinned out with water or a mix of water/vinegar. Kale! My favorite is the crisp and firm varieties like the Curly / Lacinato / Dinosaur. Curly Kale seems to grab and hold the sauce better (more flavor!) and doesn’t crumble as easily in your hands when munching them. To prep them, you should be able to to hold the stem with one hand and run your other hand from the stem to the tip, pulling the leafy part right off, leaving just the stem to toss into your compost bin. I tried juicing them for a while but I had so much, I just couldn’t keep up. 3 gallon pot of Kale (de-stemmed). Have fun with it. I rarely make it the same way twice but the recipe above is my base. It never seems to miss the mark. 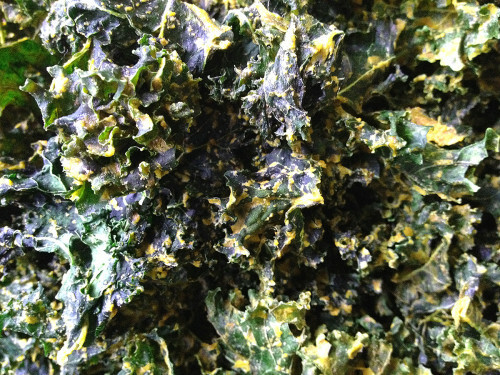 I just love these kale chips! Be prepared, they will go fast.